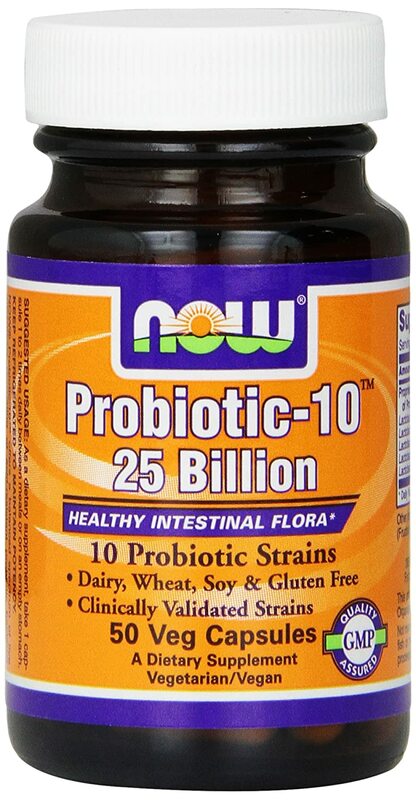 Now Foods Probiotic-10 25 billion is one of the best rated probiotic supplements on Amazon. It' no wonder, since the company had other big success products on the market. They are not innovators in the field, but their products are very successful. How that does happen? What causes their great success on the supplements market? They look at other successful products, they improve them through manufacturing, sourcing, and research, and they make a cheaper version of it. Probiotic-10 is no exception from their success formula. It is probably one of the most affordable supplements in the category. On this supplements niche affordable can many times mean inefficient, or plainly scam. Not the case with this product, which has the Now Foods quality guarantee. I already mentioned the affordability of this probiotic, but let's see what that means. A bottle of Probiotic-10 is on Amazon around 15$. This bottle contains 50 capsules with 25 billion CFU live organisms. This means a bottle can last you almost a month if you take two capsules per day. This means around 20$ per month. But many people will only need one capsule, so the price decreases dramatically. I personally like the 25 billion capsules. They are the best for people with minor conditions, or for maintenance. Lower CFUs are usually not that effective, except a few strains. Higher CFUs are too expensive, if you only maintain, and it is wasteful. The best thing about it is that this product can be easily adapted for people with serious problems, who need higher doses. It is very easy to take three capsules two times per day, for example. It won't be feasible for extremely high doses, as with VSL#3, though. VSL#3 is probably the best route for people with serious GI conditions. However, this could easily be a maintenance product, after the condition has been stabilised with VSL#3. I like the Now Foods' blend because it contains some microorganisms that target allergy symptoms. There is a strong evidence that allergies are caused by a microflora imbalance. The latest research in the field pointed at a few strains that can modulate immunity, and reduce allergy symptoms and even eliminate them. I know fermented foods can be a great source of probiotics for allergy sufferers, but my daughters are the product of the modern society, and they won’t touch fermented foods because they smell yucky. So I had to recourse to the modern society’s aid to help them with allergies. 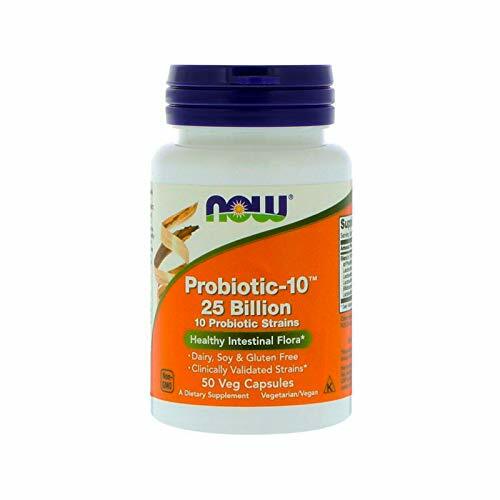 In my research, I looked for products aimed specifically at allergy sufferers, and Now Foods Probiotic-10 was one of them. Obviously, I didn’t jump in and bought this without any research about the efficiency of the product. In the end, even Now Foods releases the occasional fluke on the market. I looked at the reviews on Amazon, and the reviews are fantastic. Research on Lactobacillus acidophilus LA-14 shows that the strain plays an important role in immunomodulation. LA-14 reduces allergies, and fights pathogens. The strain is produced by the renowned Danisco, and this is some information on their research on FDA’s website. BI-04 is another strain produced by Danisco. B. Lactis BI-04 is effective for increasing immunity, and protecting against inflammation. Here is the technical memorandum from Danisco. Lactobacillus plantarum Lp-115 is a strain very resistant to stomach acid and bile, and it showed great capacity to adhere to gut and survive to colonize the intestine. It may also be effective in treating allergies. Its ability to boost the immune system makes it only a natural fit in the Now Foods’ blend. Bl-05 was found effective in reducing symptoms of allergies, and increasing immunity. Another strain with a big role in improving immunity, LR-32 is very effective at expelling intestinal parasites. It also improves the intestinal health by stimulating intestinal cell replication. S. thermophilus is one of the best strains found in yogurt. There is a lot of research on it, and even the promoters of SCD Legal Yogurt recommend it. S. thermophilus is effective treating food allergies and preventing house dust mite allergies. However, there is not much information about the specific strain, (St-21), found in this probiotic blend. Lpc-37 has been shown to eliminate pathogens, most notably Staphylococcus aureus. It is also resistant to stomach acid, and it even withstands antibiotics, so it is a powerful adjuvant to antibiotics. It also reinforces immunity mechanisms. The most notable feature of Bb-03 is to produce short-chain fatty acids, essential in intestinal health, and immunity. Lactobacillus Salivarius has a great survival rate in the intestinal tract, and it is known to inhibit pathogens. Its ability to affect positively immunity, and to regulate intestinal transit make it a great addition to this blend. LC-11 is a Lactobacillus casei strain, and research has found it to provide the following health benefits: occasional constipation or diarrhea, improve allergy symptoms, boosts immunity, and fights pathogens. The focus on this probiotic blend seem to be on immunity and allergies control, and secondary on promoting intestinal health. I love the fact that Now Foods discloses the specific strains on the label. Most manufacturers will specify just the specie on the label, and this does not tell us much about the efficacy of their product. My only critique about Probiotic-10 is that about half of the strains in the blend so not have any peer reviewed research. The product should be arriving in perfect shape from the storing facilities to your door. The product is kept in freezers, and if the bottle is not opened, it should not lose potency for 3 days during shipping. In the summer, however, if shipping takes more than 3 days, the microorganisms in capsules might die.